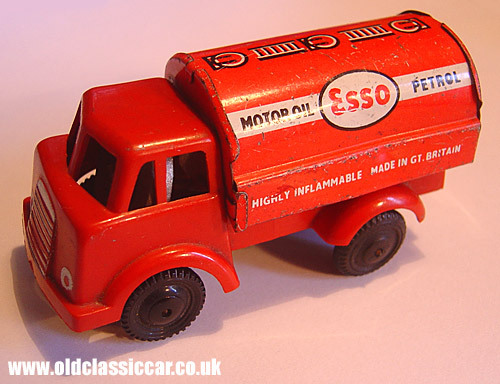 Wells Brimtoy petrol tanker in the colours of Esso Motor Oil. Esso Fuel Tanker by Wells Brimtoy. This small tinplate & plastic toy was bought from a local market, and reminds me of the Bedford S type lorries of the 1950s. It measures less than 3.5 inches in length. The cab and chassis are plastic, the tanker section is made from tin plate, neatly lithographed in the colours of Esso Motor Oil & Petrol. One side of the tanker says 'Highly Inflammable', the other a reminder of the vehicle's 20mph speed limit. On the rear is a registration number, AW560. There is no sign of a maker's name anywhere, other than the fact that it was 'Made in Great Britain', however John B has been in touch, and says that it was made by Wells Brimtoy, part of their Pocketoy range. I've seen several of these lorries using the same cab and chassis, but with different toy rear bodies fitted. It has a friction drive to the rear wheels, and was made circa 1955. This is from the first release of this range apparently, release two having a more rounded front end, and release three no push and go mechanism.